Doi Wawee is a very remote village in the mountains of Northern Thailand, located about 45 km west of Doi Mae Salong at an altitude of about 1500m above sea level. 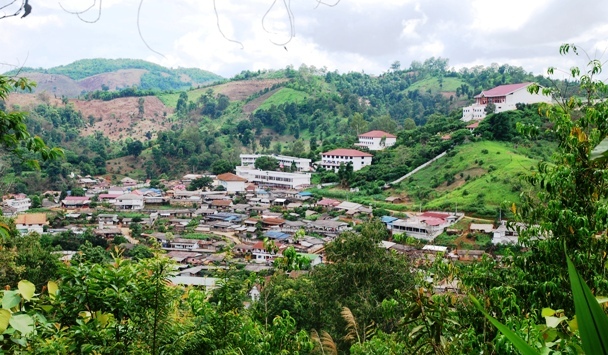 I had repeatedly received hints from private and Internet sources that maintained that, just like Doi Mae Salong, the resident community of the Chinese Kuomintang village of Doi Wawee grows tea on a larger scale, and therefore I had been planning a visit to the remote mountain enclave for some time. Well, I finally made it happen. Once again with my 6-year-old son Alex, who had accompanied me on all my tea journeys so far, our plan was to travel by bus from Chiang Mai to Chiang Rai, where we would rent a motorbike for the rest of the journey, since there’s no public transport to Doi Wawee available (yet). The motorbike ride from Chiang Rai to Doi Wawee takes us little more than 2 hours. The road is an up and down serpentine trail, but the constantly alternating mountain panoramas and views of picturesque valleys ensure there’s no boredom coming up on the way. We first drive back towards Chiang Mai, turn right off the superhighway after about 15km to follow a still very reasonable road leading direction Mae Suay. From this road, a definitely less reasonable, though still more or less paved trail turns left shortly before reaching Mae Suay. We follow it and begin the 50km long climb, not a continuous one, but in form of a series of alternating mountains and valleys that will ultimately take us further up from each single peak to the next. Unfortunately, the day had already progressed to late afternoon by then. The idea of being still on that road after dark and in the worst case in potential rain, caused me to pursue a rather fast-paced style of driving. The peaks of the mountains above us, and then below us as well, are partially draped in clouds. We are lucky and not only manage to make it just in time, but even dry. However, it is just about nightfall, when we arrive at Doi Wawee. 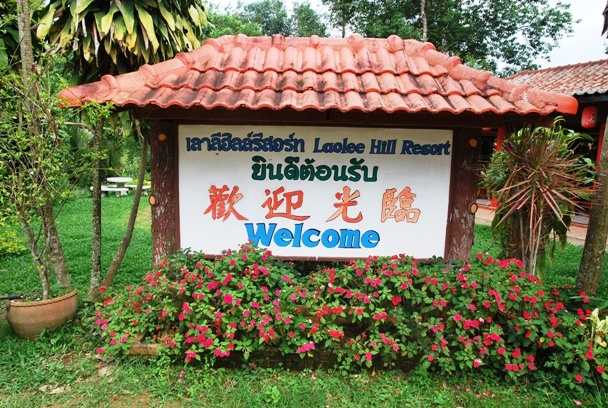 The town’s only accommodation option is the Laolee Hill Resort, run by a Chinese family that, as we learn later, does not only own most of the surrounding tea plantations, but also played a crucial role in the idea and realization of importing tea plants from Taiwan, and the subsequent years of development of Doi Wawee’s tea cultivation and distribution. We are happy to have arrived and, after moving in to our bungalow, which turns out to be excellent considering the more than reasonable price of only 600THB per night, we make ourselves comfortable at the resort’s restaurant. 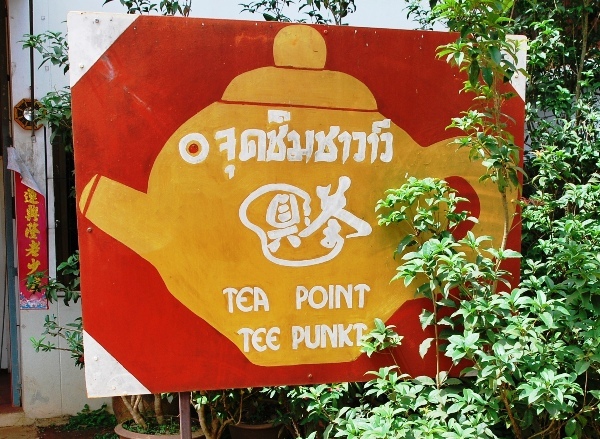 Pang Kham: Tea Village in No-Man’s Land. Our room features not only 2 comfortable beds, a separate bathroom with hot shower and a TV, on which, thanks to satellite technology, for a change no Thai, but only Chinese programs are showing, but also a back balcony revealing that we are definitely in the right place for tea here. 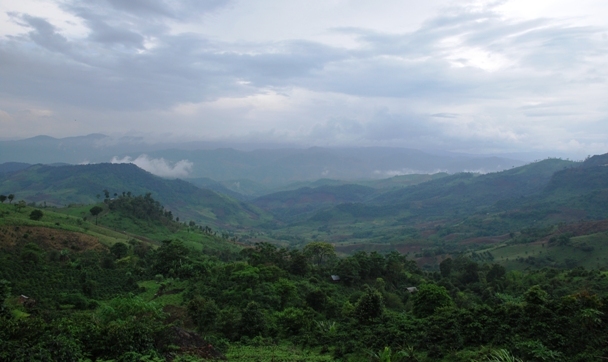 Since Thaton is located in a river valley, we need to bring a difference in altitude of about 1,000 meters behind us. 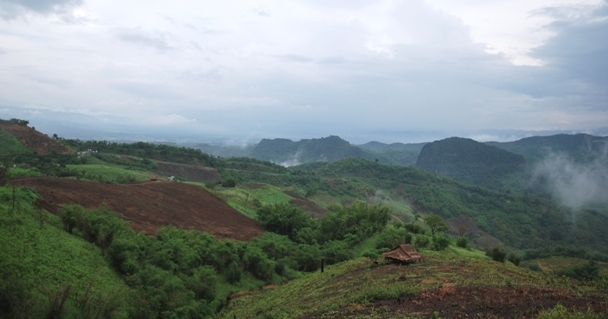 The panoramic view just before our final “descent” to the valley of Thaton, is breathtaking indeed. After stocking up with some new cash in Thaton, we drive back to Doi Wawee, where we finally take on our visit to the tea plantations. From our resort, a large part of the cultivation areas are accessible by foot. 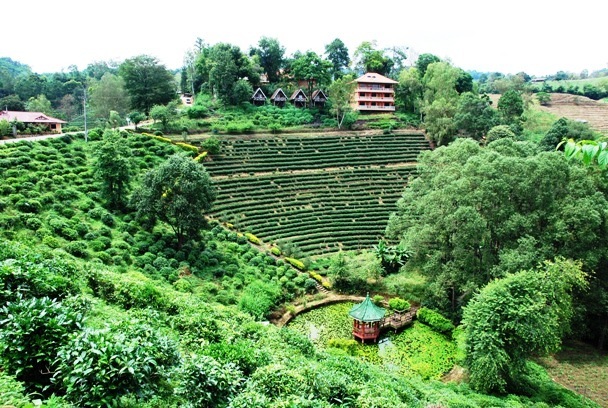 For a while, we climb about the tea slopes, where photographic tea plantation motifs and perspectives open up in abundance. It becomes obvious that the cultivation areas had to be reclaimed from the wooded hills in a tedious effort. Just as we just are about to make it back to the resort, we meet a son of the operator family of the same and these plantations, who we have already met on the previous evening, and he invites us on a tour of the nearby family-owned tea factory. Of course, we don’t let this opportunity slip. 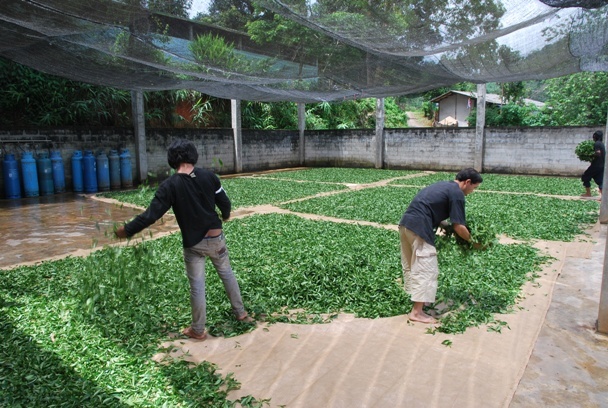 In front of the factory, large amounts of tea leaves are spread out for drying in the sun. Further piles of tea leaves are just about being evenly distributed on the ground. The factory building itself is impressingly large, which is, however, not surprising, given the scope of cultivation areas we have witnessed. 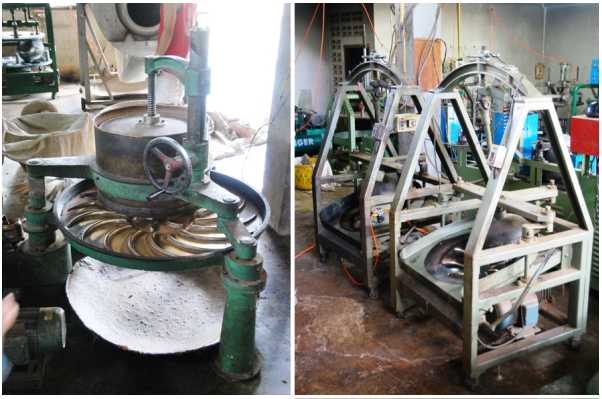 We see equipment and machinery just like that we already know from our visits to Doi Mae Salong and Pang Kham. 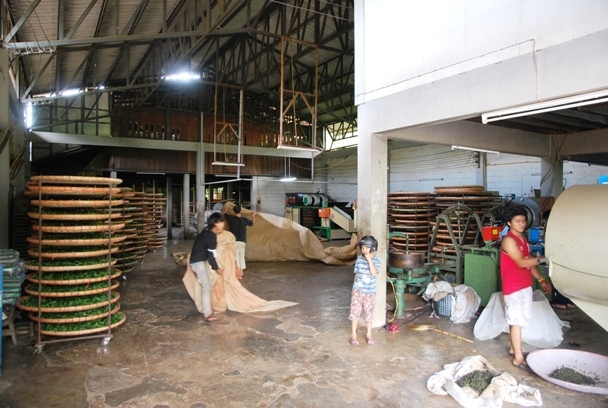 While the equipment we’ve seen in the also rather remote Pang Kham appeared to be rather old and highly labor-intensive, the machinery here, as in Doi Mae Salong, is very modern and suitable for the processing of large amounts of tea leaves. We arrive just in time to track most of a processing cycle. A charge of tea leaves, after being heat-treated under rotation, is just discharged from an oversized heating drum. 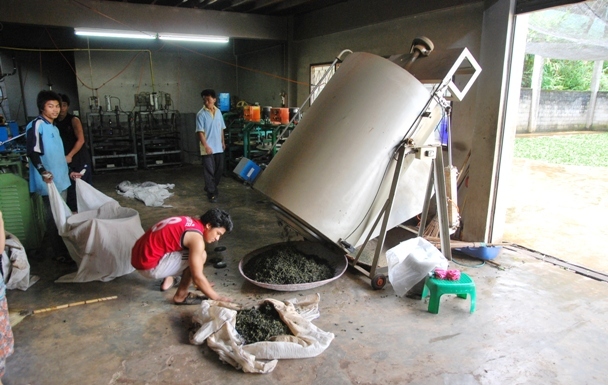 The tea leaves are then further processed on the characteristic “centrifuges”. 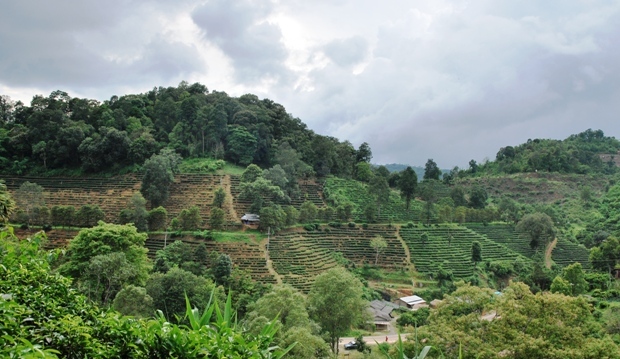 Of these, we see both the legacy version as we know it from Pang Kham, and rather contemporary designs, as we’ve seen in our supplier’s tea factory in Doi Mae Salong. 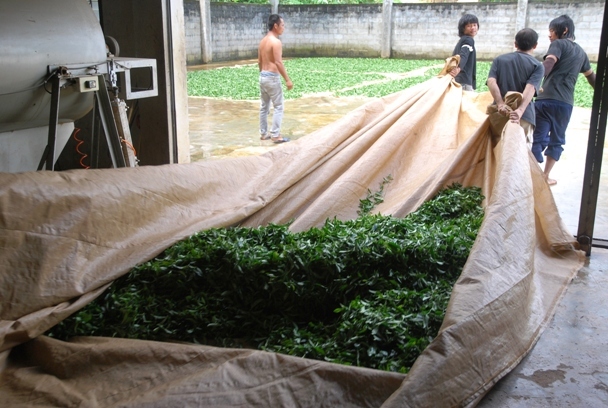 The transport of the processed tea leaves from the factory back to the open takes place by means of a rather “traditional” and quite labor-intensive method. After our visit to the tea factory and back at the resort, we inspect the resort’s own tea shop, which seems to have a lot to offer at first glance. 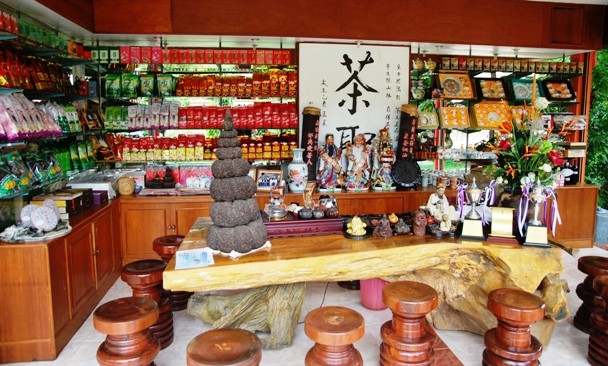 Besides unique features of affinity with the Chinese culture, especially one thing catches the eye right away: a Pu’er Tea Monument, just over 1m high, enthroned on the counter of the tea-shop. As it turns out, this sculpture is not just a decorative element of the shop, but actually represents a branch of the tea-processing in Doi Wawee, which is unique for Northern Thailand: the production of Pu’er tea. Pu’er tea is a Green Tea, post-fermented over a longer period, non-oxidized and usually pressed, made from a large-leaved Camellia Sinensis species. 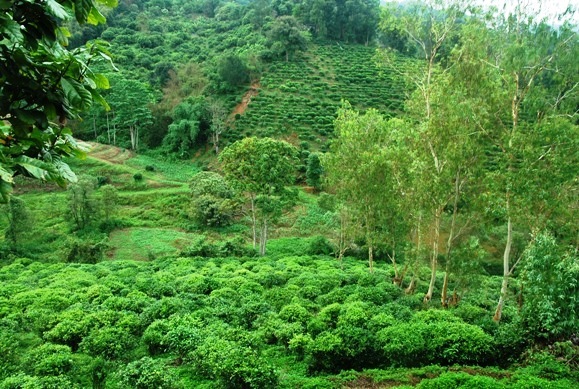 The post-fermentation takes place by means of microbial processes that are triggered by organisms growing in the tea. There are basically two types of Pu’er tea: Pu’er tea pressed in its raw condition Pu’er tea ripened prior to the pressing (“raw” and “ripened” Pu’er). 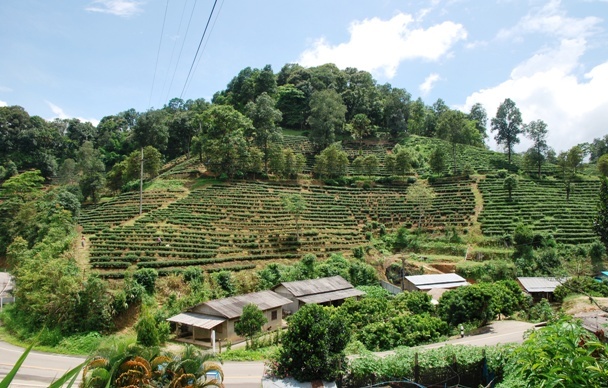 Just like the founders of Doi Mae Salong and Doi Wawee, the tradition and art of the Pu’er production comes from the Chinese province of Yunnan. A demonstration of the product by the resort owner makes clear that not only the Pu’er tea’s manufacturing and storing for maturity (here: 5 years!) were advanced to a higher art in Doi Wawee, but also its packaging. 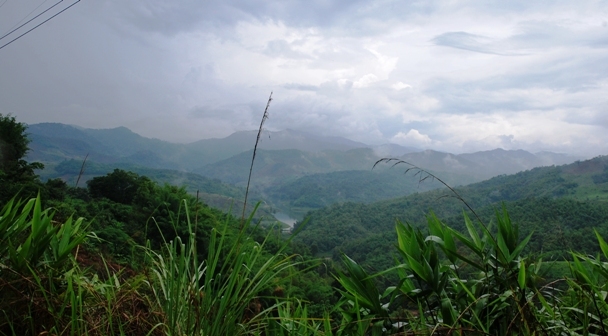 Apart from Pu’er, Doi Wawee produces a nearly identical, though somewhat smaller range of teas as Doi Mae Salong, especially the fine and world-renowned Taiwanese Oolong tea species No.17 and No.12 Oolong, along with green tea, jasmine tea and the Jiaogulan tea collected from wild growth by local hill tribes. 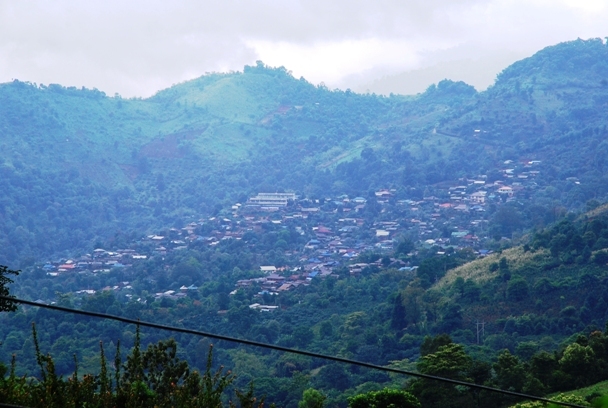 By late afternoon, we pay a visit to the 4 km away Doi Wawee Town (“Ban Doi Wawee). 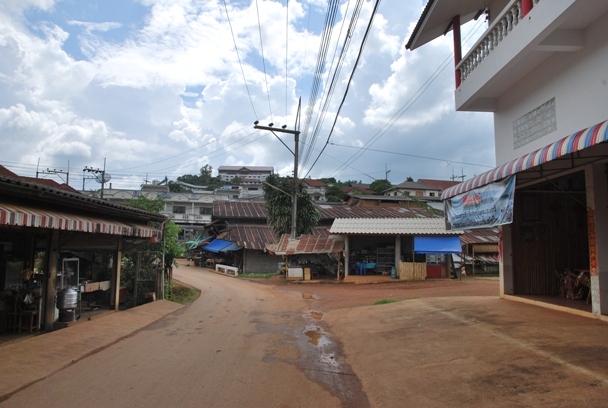 The town is rather small, much smaller than Doi Mae Salong. 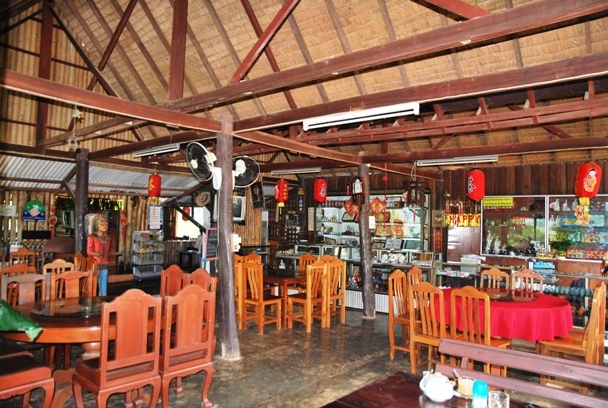 Otherwise, the similarities between the two Chinese towns in the mountains of Northern Thailand are more than obvious. The town’s “attractions” are pretty much limited to an Internet cafe, where I can’t read my emails, because Yahoo doesn’t work, and a number of small local restaurants serving Chinese rice and noodle soup dishes. 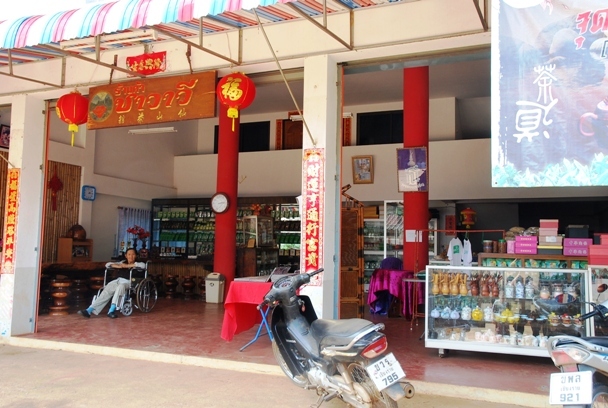 Apart from that, there’s another tea shop in Ban Doi Wawee that seems to serve as a sort of meeting place and focal point for the few tourists visiting during Northern Thailand’s tourist high season. Where otherwise there are virtually no visible signs of tourism, the tea shop’s sign board in German and English language, although somehow seeming sort of misplaced, indicates that there must have been foreigners coming through here before, and that their presence is actually considered as something desirable. 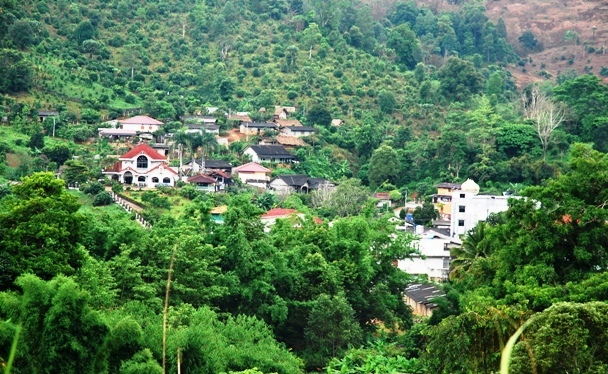 Besides the town’s “center” itself, Doi Wawee has a number of branches extending up to about half the height of the surrounding hill slopes, but also these are not as extensive as those of Doi Mae Salong. Once again, we make ourselves comfortable at our resort for the remains of the evening, chatting with our hosts for a while about the development and opportunities of the local tea cultivation. Since I had heard of a village located about 4 km from Ban Doi Chang, where supposedly a larger-scale organic cultivation and production of Green Teas and Oolong Teas is maintained by a group of wealthy philanthropists from Bangkok, our return path to Chiang Rai on the next day leads via Doi Chang. 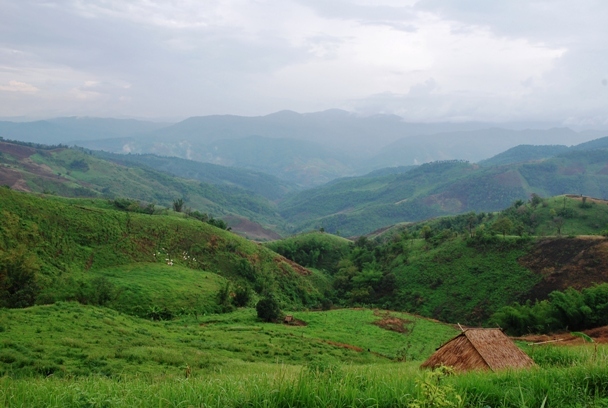 Although we don’t reach said tea village that day anymore, because unfortunately we run out of time, the detour made in order to get to Doi Chang is, seen under the landscape aspect, offering some of our trip’s the most remarkable impressions, clearly worth the effort. The scenery virtually changes with every vanquished hill, and the fact that I “need to” stop every few hundred meters in order to shoot photos is probably to blame for the circumstance that we have to re-schedule our planned visit to the tea village near Ban Doi Chang to the next possible opportunity. 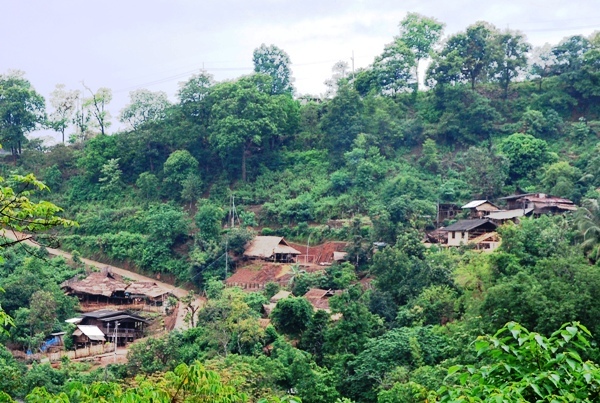 Time and again on the way we see smaller settlements of the indigenous hill tribes being nestled in the idyllic slopes. 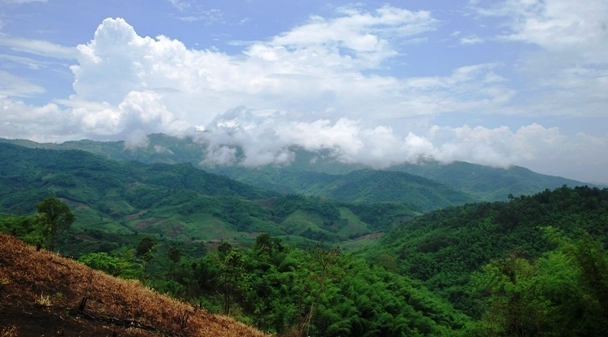 The closer we get to Doi Chang, the more spectacular scenery and views become. We have reached just before Ban Doi Chang, when in a restaurant by the roadside, where we have a snack, we are told that the direct route to Ban Doi Chang presently wouldn’t be passable because of the rains. For us, this means that we must take the same way back that we came. 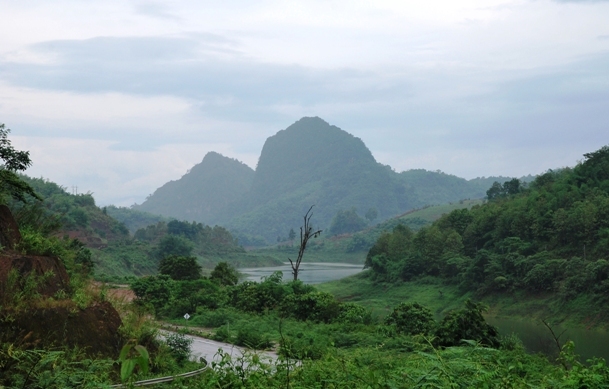 We have a last regretful look at Ban Doi Chang lying before us and then set off on the way back. I decide not to miss the opportunity to eventually collect the Pu’er tea for shipment to Germany at Doi Wawee in person, rather than having it sent to Chiang Mai as offered, and to use this occasion to still pay a visit to Ban Doi Chang and its nearby tea village, where we did not reach this time.